Thank you for checking out the latest edition of the Great Plains Energy Corridor’s Spotlight on North Dakota Energy! 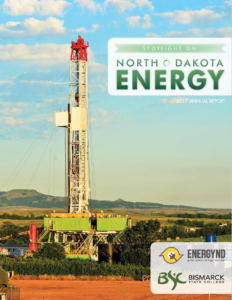 This report is a statistical overview of all forms of energy in North Dakota for the year 2017 – updated annually and usually distributed at the end of the first quarter of the following year. The Great Plains Energy Corridor, housed at Bismarck State College’s National Energy Center of Excellence, works with partners in government, education and the private sector to promote and enhance North Dakota’s energy development. Together we provide information, education, outreach programs and special events on a wide range of energy topics. Peruse this website to find more detailed information about what you see in this booklet. To request a hard copy of the annual report, please email bsc.gpec@bismarckstate.edu. We’d like to extend our sincere appreciation to the organizations that helped provide up-to-date information for this year’s Spotlight on North Dakota Energy.